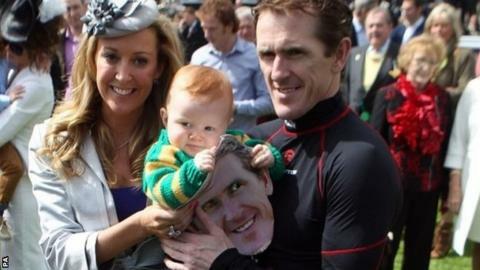 AP McCoy was crowned champion jump jockey for the 19th successive year at Sandown on Saturday. McCoy, who was accompanied by dasughter Eve and baby son Archie who had a heart operation last month, indicated he would like to eventually reach the 5,000-winner mark. "I feel as good as ever. I'd like to win a few more jockeys' titles yet," he said. "It has been the most traumatic year of all personally, with my son Archie having a major operation before Cheltenham. Hopefully he will be OK, but we won't probably know for a while longer." The jockey's triumphs in the 2013-14 season, which ends at the Surrey track on Saturday, have come at a winning strike rate of 24%. "You start off at the beginning of the season and the goal is to be champion, and I've been lucky enough to achieve it 19 times," McCoy told BBC Radio 5 live. "I'd like to achieve it again next season if possible." Fellow jockey Sam Twiston-Davies said: "We all look up to him massively. He's the most amazing man and we're all very lucky to be riding in the same era as him." McCoy is the retained rider for JP McManus, who was the season's leading owner. Paul Nicholls is champion trainer for the eighth time, after beating last year's winner Nicky Henderson. Gavin Sheehan received the annual award for champion conditional jockey.